It is a mirror that reflects back to us our thoughts, bare and open. The quiet at times can be a cocoon that wraps us in a comforting, almost holy… stillness. At peace in the company of our my own thoughts and dreams, I love to retreat to this space away from the frantic noise of the world. I allow myself to feel the stillness, to rest into the arms of quiet. Make a habit of time away. Silence is powerful. Silence allows cells to grow, bodies to heal. Scientific studies in the last few years have shown strong evidence for the power of silence on our brain. Still, most people are uncomfortable with silence and feel the need to fill it with something, laughter, conversation, music, TV… anything. As and artist I find I especially need this time to retreat. Everyday I absorb and reflect the world around me. Art is a way I am able to process all that I feel, but in the hussle and push of modern life, I don’t get time to create as much as I need to. Busy family life, personal goals, physical pain, all drive me along each day at a pace that I constantly pull and tug against. This life is exactly what I want, and I am grateful for every bit of every day. However, balance seems like it is always just out of my reach, and many times I find myself in a desert of creativity. Dry parched, exhausted in every way. 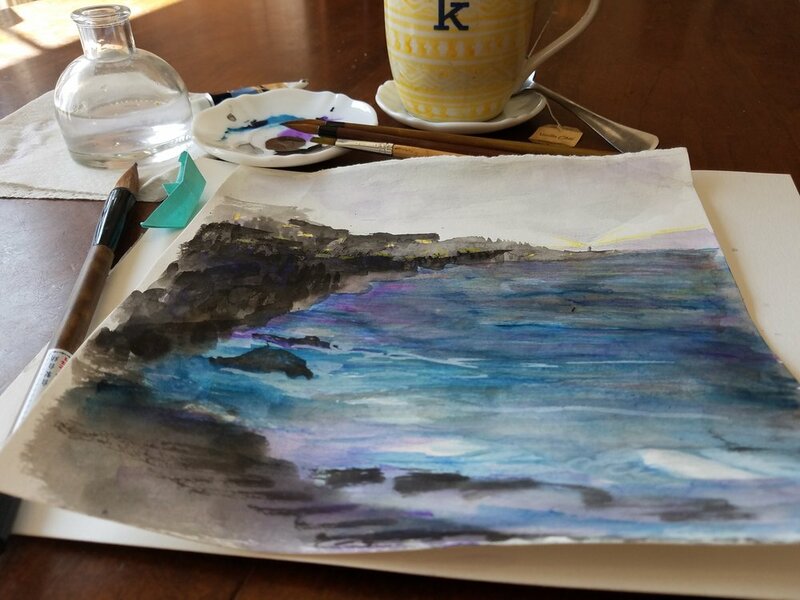 I see what I need, but it is a canyon that yawns between the daily demands and the creative space I need. That time away to create and think and be still that my mind and soul is so desperately longing for is a constant struggle. 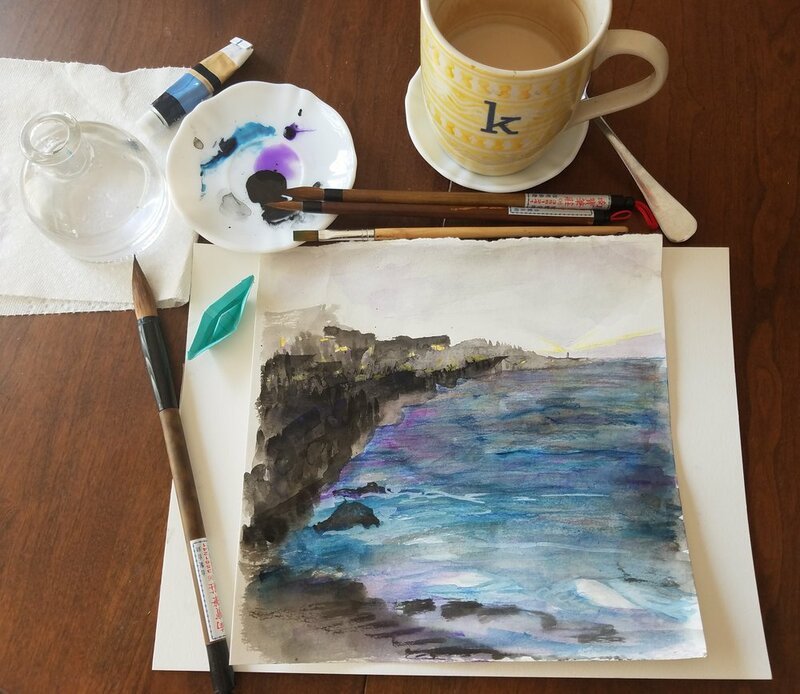 Even when I have the time, I am at battle with my own guilt and distraction until I finally surrender to the creative expression that settles me. Why do we continually run from the quiet we know we need, what are we so afraid of? The solitude of quiet is not always a resting place. In the defining quiet, It can feel dry and lonely, void of inspiration and reward. At times the silence can be a torture, a space in my head of worry or pain. Where memories or hopes swirl in distraction and chaos. But maybe it is really that on our own, we are our worst enemy and in the absence of distraction, we come to face with all that holds us back. Or, could it be, that it is in the silence we most often meet our sadness and close behind that, our anger and fear. It is said, that to be human means to experience sadness, so we are not alone, it is not uncommon to anyone. What if we embraced our sadness instead of running from it? What if we just sit with it for a while, look deep into the face of our own grief or fear… even our anger. Allow ourselves to shout, cry, move, feel everything until we can be still. And in that moment, we may realize that the Creator (God with us), is there, quietly holding us in the silence and depth of our emotion. As we sit with our emotion, we are finally able to untangle our fists and release our grip on sadness, in turn, feel the release of its grip on us. It is often in the hollow of this quiet when we may begin to think when nothing is happening, that we are most able to hear our soul song. The quiet allows healing, it creates space in our hearts for joy. In the stillness creativity blooms, and we are able to hear the whisper of the Divine and have the clarity to adjust our sails to the winds of purpose. So breathe... find beauty in the quiet parts of your heart or week, or year. Embrace all that the silence holds, let the stillness fill you with gratitude, creativity, and purpose. When I was young, I loved to stand in the waves as a storm rolled in. My feet gripping the rocky beach, I would feel the intensity of being immersed in nature's power all around me. I would stay until the waves crashed too high and too strong, and I was numb with cold. I would climb the trail to the warmth of my grandparents' house and unthaw in the heat of the shower and by the wood stove. At times lately, the swirl of humanity and the pace of the world feels like a raging storm all around... so much anger and sadness. If we do not stay rooted on a solid foundation, it has the power to knock us off of our feet. Peace within, and belief in a loving God that does exist, helps me stay grounded and keeps me focused with a positive mind. It makes me very sad when I hear people question whether God exists at all. There is an emptiness that is a hollow place of endless searching in that question. Humans have a spiritual element that we cannot ignore. We can chase many things for happiness, but at the very least, believing in a Higher Power outside of ourselves is at the beginning of a life of happiness and inspiration. I don’t wonder why people are distrusting and disheartened with the idea of God. Humans have vastly misinterpreted and misrepresented the Eternal. And how can we possibly understand a force so vast and so complex, so much bigger than we can possibly reach. So humans come up with a narrative a self-sufficiency. People over centuries have spun and evolved stories and theories that justify a way out of a Creator and Deity that is unseen. They determine that we are nothing but matter and cell. We are only organisms of existence and we only find higher meaning within our own creation and that is enough. We are nothing more than what can be seen, and it is sufficient just to not harm others. Anyone who dares to propose differently is criticised and scorned. Deep down, however, there continues to nag a longing, a whisper… a calling. A persistent longing to a relationship with the Almighty, A communion with the creator of the stars. A call to believe without having all of the answers. That is what faith is. I don’t pretend to understand God or all that is. I am aware I don’t see the whole picture. But every precise movement of nature, or kindness of humanity, the precision of it all reassures me that the spiritual presence is not one of carelessness, but of careful design and interactions in the smallest detail. It is this belief that is as solid as the rocks beneath the pounding waves. The well-known story in the Bible of Jesus, calming the storm stands out to me. Told in Matthew, Mark, and Luke. The Disciples were terrified and amazed. They asked each other, “who is this man? Even the wind and waves obey him!” Little lakes on a stormy sea and God who makes peace of it all. The world may be tossing like dark waves all around, but there is one who defies logic and calms the soul. That in return for faith gives peace that passes all earthly understanding. No, we are not merely matter, but a treasure that matters to the Creator of the universe. It is still dark and early, but I open my eyes and glance at the time on my phone. Just a few minutes before the alarm is set…. Deep inside, my mind nudges me to rise. I pause for a minute drifting in the foggy space between sleep, each window in my mind slowly opening and letting in light. I turn off the alarm, and I unfold from the comforting nest of covers, attempting to be quiet so not to disturb my still sleeping husband. I slowly stretch and rise completely, the dogs knowing my cue stretch and shake their ears and stretch too. They look at me with a wag, a yawn and a squeak, happy to say hello even though they were near me all night. We quietly make our way down stairs, I let them out and head to the kitchen for water and to make coffee. Just as I finish, the dogs are back at the door. They are triumphant, having surveyed the yard from any night creature activity. Breakfast for them and everyone else now. I put on hot water for the girl’s tea, cut up some fruit or set out vitamins and granola bars or veggies for everyone to pack lunches or grab as they go out the door. An alarm plays from upstairs and I head in it’s direction. Time to turn on lights, soft greetings and morning kisses for everyone… Time to get going. The day has begun. Routine. There is something comforting and steady about our routines. Whether it is morning, or night, for eating or exercise, sleep or sanctuary. Routines are the compass that guides us when we are not sure what to do. It is the habits that tie us intimately with our home and the loved ones we share our lives with. The essence and style of what makes us individual. Even when we are not aware, so automatic are our daily routines, they are the margins hold us securely from day to day supporting the lines that tell the story that becomes our lives. The time change was this week, and everyone knows the havoc it leaves in its wake. More accidents, less patience, crying babies and cranky adults. One hour can throw us off physically, mentally, spiritually. So important is time to our health and state of mind. We don’t even realize it until it is somehow disturbed. Getting the new time calibrated and back in sync with our routine is essential. It is in our routines that we build the channels that form the current of our life. It is also where we have choice. It does take some work to change habits or live with intention, but whatever it is that we want to make better in our lives, if we incorporate it in our daily routine, it will eventually form who we are. Whether thoughts or actions, Everything from overcoming self doubt, to healthy living. It is in our routines that our habits are formed, and those habits weave together and soon the person we wish we were... is exactly who we have become.